This is my second review for the 2010 Period Drama Challenge hosted by Lights, Camera…History! 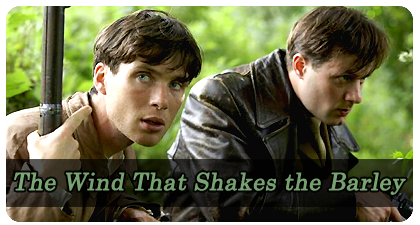 Set in rural County Cork, the 2006 Palme D’Or winner The Wind That Shakes the Barley is the story of Damien and Teddy O’Donovan, two brothers (played by Cillian Murphy and Pádraic Delaney respectively) who take opposite views on the Anglo-Irish Treaty. The film begins in 1920 with a hurling match between young men. After the game they are confronted by the Black and Tans, an armed force employed by the Royal Irish Constabulary. Although he witnesses the fatal beating of his friend Micheail, who refuses to say his name in English, Damien elects to pursue his medical studies at a prestigious London hospital. But as he prepares to leave town, Damien sees a railway guard and the train driver resist armed British forces. The guard is beaten and Damien chooses to stay behind and help, subsequently joining his more militant brother Teddy as a member of the IRA. The IRA column promptly infiltrates an army barracks for guns, which they use to assassinate four British Auxiliaries in a local pub. The brigade is captured after an Anglo-Irish landowner presses his servant Chris Reilly, a teenage IRA member, into revealing their location. All are set to be executed the next morning but a sympathetic Irish officer helps all but three prisoners to escape. Unfortunately Chris’ part in their capture means that the brigade have orders from Headquarters to execute him as a traitor. The act is performed by Damien, who has known him since he was a child. “I’ve crossed the line now Sinéad…I can’t feel anything,” he tells his sweetheart afterwards. Further acts of violence on both sides persist until a truce is declared and the Anglo-Irish Treaty signed, but the Treaty divides the IRA and the brothers. While Teddy argues that the terms are a starting point and that more gains can be made in the future, Damien believes that the war must continue until complete independence form Great Britain is achieved. Damien (Cillian Murphy) joins the IRA. The Wind That Shakes the Barley features fictional characters but historical events and figures are mentioned, such as socialist leader James Connolly. While awaiting execution, Dan and Damien discuss Connolly’s ideas, and Dan says that he saw the man speak at the Dublin Lock-out which occurred between August 1913 and January 1914. The sport of hurling, played in the opening scene of the movie, also has a historical basis. Many members of its Gaelic Athletic Association had been connected to the 1916 Easter Rising, so by 1918 the British government banned the organization completely. Yet the sport continued to be played as an act of Irish defiance. The title of the movie comes from a poem of the same name. Written by 19th century poet Robert D. Joyce, “The Wind That Shakes the Barley” is about a rebel soon to take part in the doomed 1798 rebellion. The poem has since been set to music and performed by many artists. The ballad is used in the movie at Micheail’s funeral. Director Ken Loach filmed the movie in rural County Cork and the Irish countryside is beautiful. Some viewers will have trouble understanding the thick Cork accents used by most of the main characters at first, but I found that it became easier to understand as I continued to watch and the dialect became familiar. The film does a wonderful job of re-creating the time period and is so engaging because it examines history in a regional light, looking at how the Anglo-Irish Treaty and guerilla warfare affected average citizens in rural Ireland. 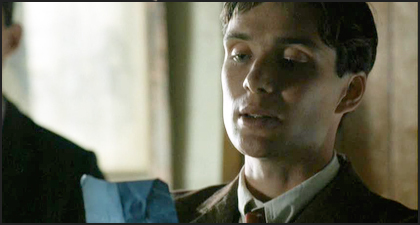 The acting is also excellent with Cillian Murphy in particular standing out. His Damien displays all the conflict that a doctor who must take action against a friend should display, but Pádraic Delaney is also wonderful as brother Teddy. This is not an easy movie to watch but it’s absolutely brilliant and provides an important look at the motivations, and events behind this turbulent time in Irish history. In The Wind That Shakes the Barley violence divides families and causes a doctor to kill in cold blood. Losses occur on both sides and no one remains immune to the violence. That is the tragedy of this powerfully moving film.